Director Karen Stewart looks back at 2017 and talks about what's to come for Nine Twenty Manufacturing & Engineering in the year ahead. Well what can I say? 2017 has been an eventful year for most of us, the world is changing, peoples mind sets are changing and we have seen so many changes in politics both at home and on a global scale, business is also changing and Industry 4 is here! So how have Nine Twenty changed over 2017? I franchised the business in 2017 which has been a learning curve for me, I have grown personally and professionally and have loved the highs and lows of the journey. Nine Twenty Engineering have changed, we have grown and are working with some of the largest employers in the UK and beyond. Here at Nine Twenty, we recognise that industry is changing and have adapted our business to allow us to offer support to our technology sectors, and we will be heavily involved in these initiatives in the coming year. We will support our clients to help them work towards Industry 4 through people, processes and technologies and we look forward to growing this area in 2018 and beyond. 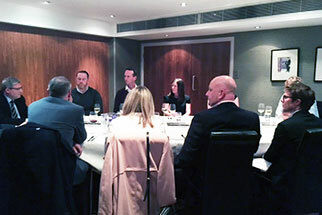 As always, we have continued in our busy social scene with our team trip to London which was great fun, we hosted various networking events including our Industry 4 round table discussion in conjunction with The Manufacturer magazine, we took a table to the HR Network awards. We have some amazing plans for 2018 events and look forward to announcing these in the new year. Our charity focus has been strong in 2017 with a major focus on raising awareness of the careers in the manufacturing, engineering and technology sectors, and we are passionate about growing and developing this in the new year. We would like to take this opportunity to thank our clients and candidates and partner businesses who have been an amazing support to us over this year, long may our relationships continue and we are excited to be working with you all next year. A final thanks to my team Nick Beecroft, Louise Conway, Nicole Lavelle and Nicole McGeehan who have all worked their socks off this year and have their plans on how to develop over 2018. The opportunities for us all in 2018 are endless, let’s ensure we all work hard, have fun and grab every opportunity that you can, we are here to support.